Fresh fennel blossoms are bewitching. (They are called umbels, by the way. Isn’t that a great word?) Chopping the teeny-tiny flowers releases the most wonderful perfume. It is summer incarnate. The fennel in my garden right now looks like fireworks, and I figured that the bees wouldn’t mind if I stole away just a little of their pollen. But the idea of a warm bowl in near 100F heat was definitely out of the question. Luckily, this is a soup that works chilled as well. The thing is though, I’ve never really been enthusiastic about cold soup. I really don’t find myself on a scorching hot day saying “OOO. What I could go for right now is a big bowl of soup.” I might, as I did on Monday night, eat a whole bowl of salsa with chips for dinner. And I’ve certainly enjoyed a few fresh veggie juices. But my most fond memory of cold soup is from Red Dwarf. 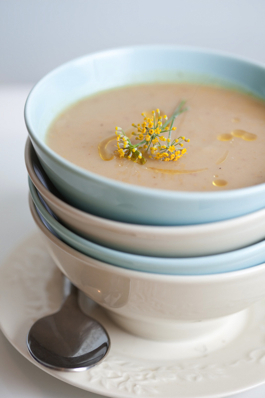 Soup is a little respite from a cold winter day. It’s like a blanket in a bowl. I have no religion about chunky versus creamy but I do like my soup hot. This week, I was more than happy to serve myself a creamy bowl of cold. I had my fill of salads and sorbets already and I really did want to make that soup. So, yesterday, I got up early when the house was still a “chilly” 75F to cook the soup. Luckily, even though I first had to make my own stock, I was done with the stove within about an hour, before the kitchen was sweltering. Then both the soup and I chilled… it in the fridge, me in the basement. By the late afternoon, when the lower level of the house was no longer much of a haven, I turned to my bowl of soup. I really was just excited about the cold. My expectations really weren’t all that high beyond that. I knew the flavors were nice as I was seasoning, but I wasn’t sure if they’d hold up once chilled. And in fact, the flavors do get more subtle when chilled. But that, as it turns out, isn’t really a drawback. In fact, it’s kind of a nice. The soup still has that grassy, anisey flavor of the fennel blossoms, but it doesn’t make a big deal about it or anything. It’s happy to just be a silky golden spoonful of summer. Just what the weatherman called for. I may just be reconsidering my stand on cold soups. The original recipe uses chicken stock, but I substituted a quick veggie stock and a little dry white wine. Also, my fennel bulb was a bit on the small side, so I added some potato… which I think added to the thickness of the soup. Heat the butter in a heavy bottom soup pot, and add the leeks and cook over medium-low heat until they are soft and translucent. Add the potato and fennel bulb and then deglaze with the wine. Add the stock and bring to a simmer. Cover and simmer for another 30 minutes. 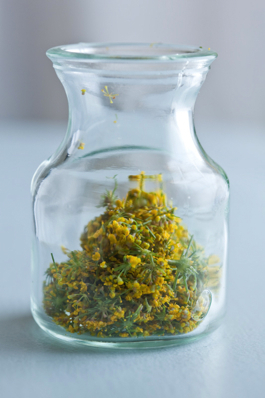 Add the fennel flowers (or pollen), then using an immersion blender if you have one (or blending in two batches if you are using a standing blender), puree until smooth. Then, puree just a little longer, just in case. Return to the pot, and bring back to a low simmer. Season with salt and pepper to taste. Serve hot or chill for at least an hour. I like mine garnished with a drizzle of a really nice olive oil. 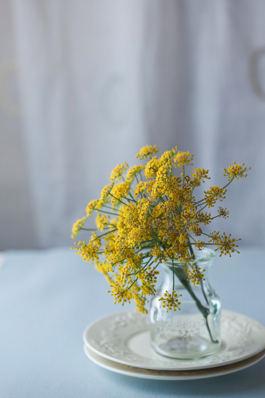 A few extra fennel flowers are also a nice addition. This entry was posted in Cookbooks, Food, Recipe, Soup. Bookmark the permalink. Such a beautiful post. The blossom is so lovely, and your soup, too. 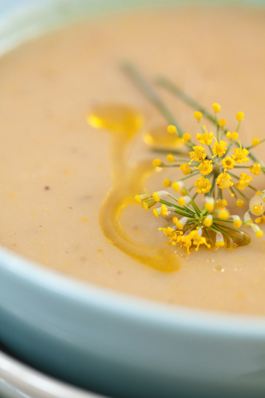 I have not seen the blossom around but your soup certainly inspires me to make some soup. I really should since we are deep in winter now. These photographs are gorgeous! The blossoms really do remind me of fireworks… they look like they’re exploding out of the jar, trying to fill the world with their bright yellow colour. I love the way you composed each photograph… the colours are simply lovely. I too am one that can come off indifferent with the idea of cold soups. They don’t usually excite me all that much, even though they are often delicious. It’s funny how that is. 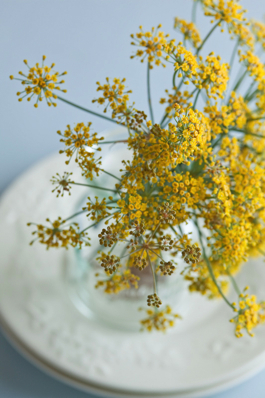 Love the fennel blossoms, and yes umbels is a wonderful word; they look like little fireworks. beautiful photos!! The soup looks extra yummy! I love the olive oil painting in the soup. 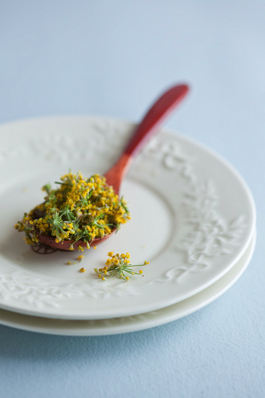 The oil and the fennel blossom are the same color. Lovely. So beautiful, and looks so rich and lovely. What a terrific idea! Last year we had many blossoms on our fennel. I would loved to have used them in a recipe. I will tuck this little gem away for use next year. No more flunking them in a vase! I come to your site occasionally and have wondered where I knew your name – then I saw your book at the bottom of the page and realized you the wonderful woman who wrote our Best Places Seattle Cookbook a friend gave us when we first moved out to the Peninsula. I love that book. Very Northwest and lovely recipes. Thank you. Whoa never seen these dainty blossoms before! mmm… that looks delicious, thanks so much for sharing 🙂 Can’t wait to try it! i love fennel! it tastes so fresh and crisp! we usually eat itwith lemon salt, olive oil and salt. nothing better! but since its already chilli 😛 outside i think the soup is a great idea! must try!